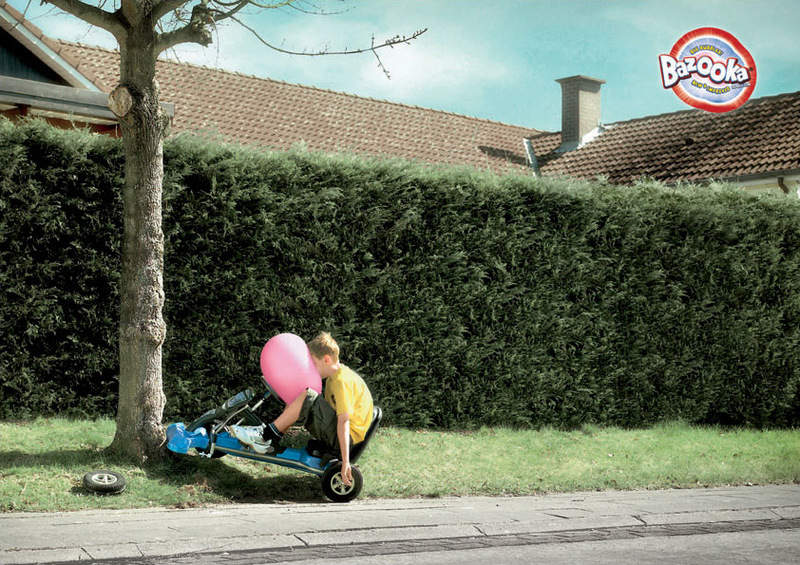 Bazooka Bubblegum, a Topps brand, is presented as crash protection for boys in Airbag, an award-winning print advertisement from Belgium. The Bazooka Airbag ad was developed at Duval Guillaume, Brussels, Belgium, by creative directors Katrien Bottez and Peter Ampe, art director Christian Loos, copywriter Raoul Maris, and photographer Marcel Veelo. The ad won Bronze at Eurobest 2007, two Silver Lions at Cannes 2008, Gold at The New York Advertising Festival in 2008, and Gold at Kinsale Sharks Awards in Ireland. Joe La Pompe presents two earlier versions of the same idea, one for Babol chewing gum in 2007, and an earlier poster for the Ford Fiesta in 1998.